Non-disclosure agreements between data center landlords and their largest customers make the job of discerning what exactly the biggest data center users are up to in the market difficult. North American Data Centers’ annual report on the largest leases, authored by the commercial real estate brokerage’s principal and co-founder Jim Kerrigan, unmasks most if not all of the previous year’s biggest deals. The unprecedented level of activity in Northern Virginia “to some degree has sucked the air out of other top-tier data center markets,” Kerrigan said in an interview with Data Center Knowledge. There were a few large deals that made up the lion’s share of the $3.84 billion of acquisition activity outlined in the NADA report. Brookfield Infrastructure’s $1.1 billion purchase of the AT&T data center portfolio led the way. The Equinix purchase of the Dallas Infomart for $800 million was a close second. (Notably, the NADC report does not include some of the bigger international deals, including Digital Realty’s joint venture with Brookfield to purchase Ascenty in Brazil and the CyrusOne purchase of Zenium in Europe). In Kerrigan’s hometown of Chicago, leasing demand was relatively anemic during the year. The largest leases were just 2.4MW and 2MW, signed by Equinix and QTS, respectively. The high cost of doing business in the area (utilities, land, labor, taxes) may have contributed to the slowdown. 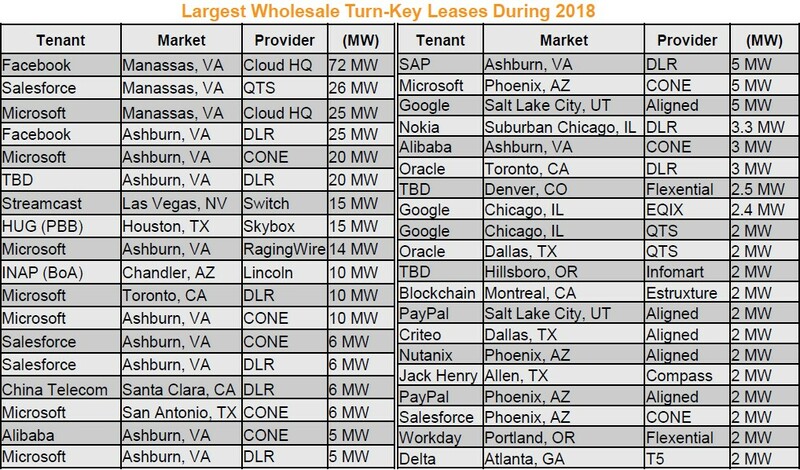 After publicly traded REITs reported bookings for the first half of 2018 it became evident that net-absorption of space in Ashburn’s “Data Center Alley” and the surrounding counties would blow away the previous year’s 115MW leasing record reported by international consulting and brokerage firms such as Jones Lang LaSalle and CBRE. Those detailed market reports are long on statistics but usually light on transaction details due to global client non-disclosure agreements. The NADC report goes a long way toward helping investors connect those dots.